Play the video above to watch a preview of the Gamble House Living Room Arm Chair video. The deal is simple. Use coupon code ‘INSTAGRAM25‘ and you will get $25 off either the Gamble House Living Room Arm Chair class or the Gamble House Bundle which includes our next project, Gamble House Inspired Side Table. You’ll immediately get access to over 10 hours of step-by-step video instruction, the plans, all future updates, and ability to download all of the videos. or bundle this and the Gamble House Inspired Table together with access to that project before it launches to the public for a savings of $25. • Sign up for our email newsletter below. On Friday August 22nd three winners will be announced! A winner from each category will be selected. 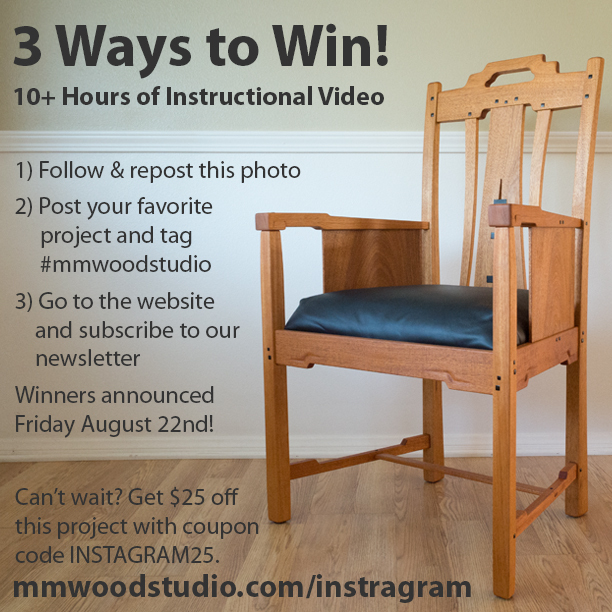 The winners will be contacted and will receive access to the Gamble House Living Room Arm Chair. If you have already purchased a class or the bundle, a full-refund will be given and your access will continue. No person can win more than once. If a credit card can not be refunded, a bank-check will be issued to the winner. If a winner can not be contacted or does not reply in 72 hours from drawing, a new winner will be announced. You may enter all three ways to increase your chances. The contest has no cash value.